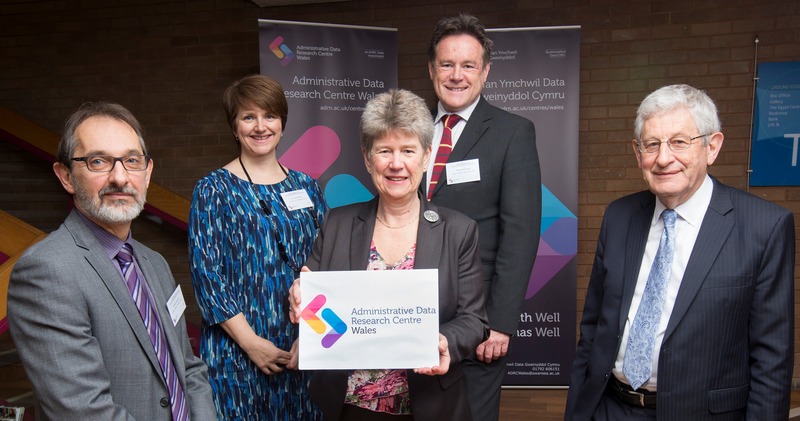 On Monday 23rd March, 2015, Jane Hutt AM, Minister for Finance and Government Business, officially launched the Administrative Data Research Centre Wales at an event at Swansea University. The Administrative Data Research Centre Wales, led by Swansea University’s College of Medicine in partnership with the Wales Institute of Social and Economic Research, Data & Methods (WISERD) at Cardiff University, is one four centres forming the Administrative Data Research Network – a UK wide Economic and Social Research Council (ESRC) funded data infrastructure that will facilitate access to de-identified administrative data to support economic and social research that has the potential to benefit society. The Administrative Data Research Centre Wales will work with accredited researchers to facilitate access to, and linking of de-identified data on themes such as education, health and social mobility data as well as many other long standing records from different government departments. The aim of the Centres is to facilitate research using de-identified linked administrative data in a safe, secure and lawful manner that at all times protects individual privacy, resulting in research that can provide a sound evidence base for policy makers to decide how best to tackle a range of complex social, economic, environmental and health issues. “No matter which part of the UK one lives in, we can be sure that Society is changing rapidly around us. Pretty much everyone wants to live in a fair and supportive world enjoying a good standard of living. But history has shown us that this is a hard ambition to realise. Society is a very complex thing and is never static. One advantage we have over previous generations is that we now have available a vast and growing array of data that can help explain how modern society works, and which can be used to assess the impacts of changes that are made. The process by which data is linked is integral to the Administrative Data Research Network and four Centres. Using an independent secure linking facility, data collected from different government bodies can be linked together so accredited researchers can analyse a more inclusive set of data in more depth. The Administrative Data Research Network consists of four Administrative Data Research Centres, one in each country in the UK and the Administrative Data Service, which coordinates the Network. The Administrative Data Research Network is a £34 million investment by the ESRC and is the first phase of a series of ESRC investments in Big Data. The launch was attended by a wide audience including representatives from academia, the community and voluntary sector and government officials. Speakers at the event included Professor David Ford, Director of the Administrative Data Research Centre Wales, Dr Fiona Armstrong, Deputy Director Policy, Resources and Communications, Economic and Social Research Council (ESRC) and researchers who outlined their previous work using linked data and the opportunities for rich and insightful outcomes that can be attained by linking data. Please follow this link to the presentations that were made on the day and also a copy of a leaflet outlining the Administrative Data Research Centre Wales.